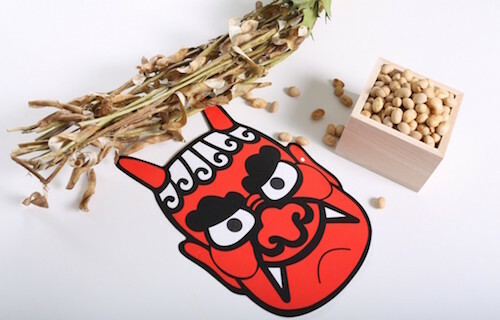 Speaking of Setubun, there are two main events: One is “Mamemaki,” which exists simply to exterminate Oni (the Japanese demon) by striking beans against it, thus also bringing good fortune. Oni is thought of as a monster that brings disaster, pestilence, or unbelievable famine, so naturally people try to drive this evil spirit away, and hope to bring good fortune at the same time by doing it. At this point, you may have a question like “Why does throwing beans bring good fortune to us?” Here is the reason why we use beans instead of throwing balls: Soy beans used during Setsubun are one of the Gokoku, or five main grain types, that people have subsisted on for a long time, including rice, wheat, millet, and common millet. Thus, people were very familiar with it. People then got to thinking that a god of crop’s soul dwelled inside, and people could use this fact to chase the devil spirits away. It became regarded as the best way to exorcise the Oni from a place. When you enjoy Mamemaki, please don’t forget to say “Out with the demon, inside with the good fortune” while throwing beans at a door or a window. 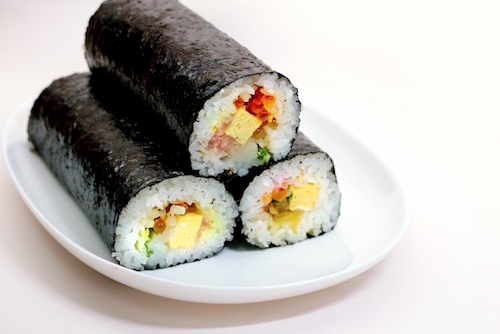 There is one more thing that comes up when we hear “Setsubun,” and it is that of “Ehoumaki.” This is a kind of sushi similar to what you may already be familiar with, with ingredients rolled inside rice and then nori. Especially for Setsubun, we prepare a bigger version and do not cut it with a knife, because to cut Ehoumaki means to cut yourself off from a fate you are to receive in the future. In addition, we have to eat it silently and facing a certain point on the compass called “Ehou,” which is where we believe there is a god. Because it is believed that a god presides over our well-being. There are many customs with many reasons behind them around the world, but why not trying for good fortune the Japanese way? It just may be an educational and delicious experience!